Did Putin Green-Light Tonight's Massive Israeli Strikes On Syria? Just off a 10-hour visit with Russian President Vladimir Putin in Moscow, and less than a day after Trump pulled out of the Iran nuclear deal, Israeli Prime Minister Benjamin Netanyahu said on Wednesday he doesn't expect Russia to act against Israeli forces as they continue exchanging fire with Syria. It appears the meeting wrapped up at the very moments a major escalation began along the Golan Heights, with both Syria and Israel trading blame for an initial attack which quickly escalated into Israeli cruise missile launches and shelling on targets in southern Syria and notably, on Damascus itself. Putin and Netanyahu at the "Victory Day Parade" at Moscow's Red Square on Wednesday. Image source: Reuters via Newsweek. The question remains, did Putin give Netanyahu the green light for tonight's events? If it wasn't clear over the past weeks and months of unprovoked Israeli strikes on Syria—ostensibly to roll back Iranian troop presence—then it should be very clear by now that Syria, Israel, and Iran are now in a state of war and all signs point to a continued intensification of the conflict. And crucially, there's currently no sign that Russia came to the aid of its close ally as rockets rained down on Damascus overnight. Russia has routinely looked the other way while Israel has conducted, by its own admission, over one hundred major strikes on Syria—most of which have come after Russian intervention on behalf of Assad in 2015. As Reuters reported late in the day Wednesday, Netanyahu told reporters just before departing Moscow: “Given what is happening in Syria at this very moment, there is a need to ensure the continuation of military coordination between the Russian military and the Israel Defence Forces.” The Russians and Israelis coordinate their actions through a direct military hotline intended to avoid accidental clashes which could lead to escalation between the two countries. A reportedly "upbeat" Netanyahu further said, “"In previous meetings, given statements that were putatively attributed to - or were made by - the Russian side, it was meant to have limited our freedom of action or harm other interests and that didn’t happen, and I have no basis to think that this time will be different." Thus it appears Israel may have been given a green light by Putin to engage targets in Syria, however, at this point it is unclear what limitations or restrictions Putin may have issued, if any at all. 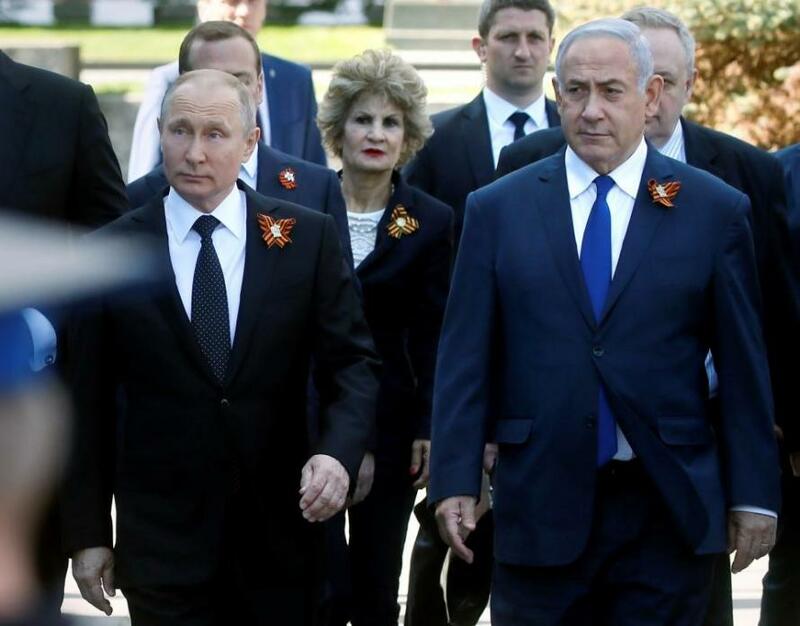 During his 10-hour Moscow visit, the Israeli leader attended, alongside Putin, annual Red Square celebrations of the anniversary of the end of World War Two. Israel recognizes the Russian date, May 9. Most Western powers mark it on May 8. Reuters also noted that Israel has not joined Western sanctions against Russia over the crisis in Ukraine and allegations that its intelligence services poisoned a Russian ex-spy in Britain. Meanwhile things are escalating in Syria by the hour and by the day. Early unconfirmed reports suggest Syrian defense systems may have intercepted multiple Israeli rockets, while the pro-opposition media site SOHR says an air strike near Damascus killed at least 15 people, including eight Iranians. Reports have cited Syrian military sources which claim "dozens" of Israeli rockets downed by Syrian air defenses during the sustained attack. As we've reported, Israel is claiming to be acting against Iranian aggression, while Syria state media reports cite government officials as saying no Iranians have engaged Israel and are not in the areas of Israeli attacks. Pro-government Al-Mayadeen reported that as of 3am (Damascus time) over 50 Rockets had been launched at Israel by Syrian forces, and journalists on the ground said Israeli aircraft engaged targets near Damascus while flying over the border area. And into the early morning hours massive explosions were still being reported around Damascus.